Following a quick visit to our Red Cross centennial kick-off celebration in Minneapolis, my son Noah has had a lot of questions about the Red Cross. And then, several days later, Noah’s 2nd grade class was given the option to dress-up as their favorite superhero. When I asked him that Tuesday evening (the day I received communication about dress-up day) if he wanted to dress-up he promptly responded, “YES!” He then stated he wanted to dress as a “real-life superhero,” a Red Cross volunteer. I frantically emailed a co-worker, asking if there was any way I could purchase a Red Cross T-shirt. The co-worker came through as my Red Cross superhero with the shirt Noah’s wearing above. Noah was beyond proud going to school dressed as a Red Cross superhero. And then, having the opportunity to walk with me in the St. Paul Winter Carnival parade was the icing on the cake! I’m so grateful to have the opportunity to expose my son to the Red Cross mission to reduce human suffering…it’s humbling and inspiring. Click here to learn more about Minnesota Red Cross Century of Service events throughout 2017. Also, use the social media hashtag #MNRedCross100 to share your Red Cross stories with us. June 28, 2016 was officially Vonnie Thomas Day in Minnesota after Governor Mark Dayton proclaimed it so in honor of Ms. Thomas’s sixty-five years of courageous Red Cross volunteer service. Read the proclamation below to learn about this remarkable woman and how she has helped and inspired many people in many ways. Now, therefore, I, Mark Dayton, Governor of Minnesota, do hereby proclaim June 28, 2016 Vonnie Thomas Day in the State of Minnesota. The Governor of Minnesota, Mark Dayton, declared June 28, 2016, as Peter Spokes Day in recognition of 65 years of volunteer service to the American Red Cross. Read below the proclamation words to learn more about the wholehearted leadership Mr. Spokes has given to us all. Now, therefore, I, Mark Dayton, Governor of Minnesota, do hereby proclaim June 28, 2016 as Peter Spokes Day in the State of Minnesota. Red Cross volunteer Susan Cebelinski checked in at the Red Cross office in Duluth, Minnesota, on April 6, 2016, before going to Louisiana where she will provide emotional support to people impacted by the flooding. Thank you Susan! Without volunteers the American Red Cross and its mission to help others would never be fulfilled. The Red Cross depends on volunteers to embrace service within their communities and to come together in times of crisis. During National Volunteer Week, April 10-16, we have the chance to express our gratitude to the women and men, heroes and leaders, and old and young, who voluntarily give their time and expertise, and wear the Red Cross on their shirt sleeves, while working to reduce human suffering. National Volunteer Week is important to the Red Cross because it has nearly 330,000 volunteers nationwide. From a disaster worker helping one or hundreds, to a military responder comforting an injured solider or family member, or to a blood donor ambassador welcoming someone who’s about to roll-up a sleeve for a cancer patient waiting for lifesaving blood, the Red Cross offers a range of volunteer positions that serve others, both neighbor and stranger. Whether Red Cross volunteers are waking up in the night to assist a family after a fire or teaching a class on how to give first aid, all of them deserve a sincere thank you from us and many others. To this we say, THANK YOU RED CROSS VOLUNTEERS! Without you, who knows where so many people in need would be today. You’re the light that shines from this organization and you continue to make a difference in your local communities, and across our country, one voluntary service action at a time. Thank you for the hours and hours you’ve given and the number of lives you’ve made better. We know that you generally take the humble path, but during National Volunteer Week it’s your turn to take a bow and accept our applause. We’re grateful for all that you do! 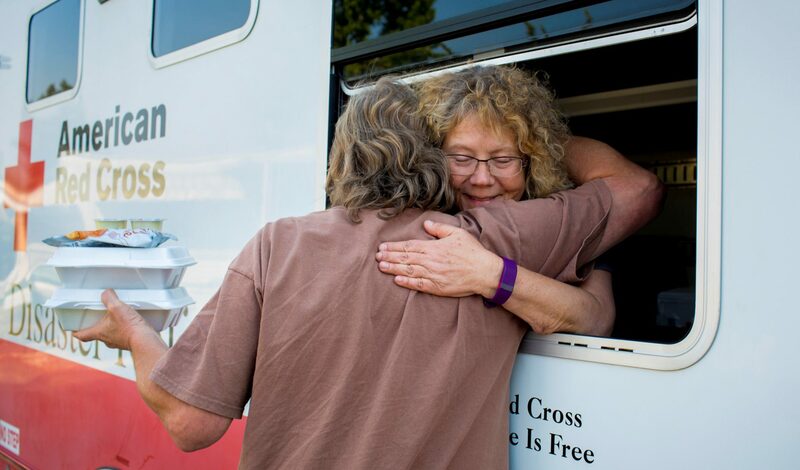 If you’re not a Red Cross volunteer but you know someone who is, give them a hug and say thanks. Ask them about their volunteer service. The many hours they spend helping others is remarkable and worth hearing about. Maybe their stories will inspire you to become a Red Cross volunteer and be the hero in someone’s life.